Huge dunks and choreographed dances were just part of the Purple and White celebration introducing this years GC basketball teams. Photo by Brian Steiner. 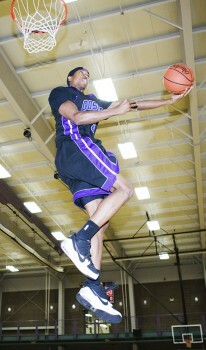 Men’s and Women’s basketball team showcase their talent at Purple and White Night. The second annual purple and white night showcased both Men’s and Women’s team. The night offered free pizza, raffle tickets for prizes like bowling, Buffalo Wild Wings, Shirts and many more. Of course the main prize of the night was the $10,000 shot from the three quarter mark of the court. Like last year the shot did not fall in to the basket. The night didn’t end there. The main events of the night included an introduction of both teams through choreographed dance by the women’s team and a dance off/drama scene by the men’s team. Then came the women’s three-point contest. Rebecca Staveteig beat Rachel Allen, making 20 three pointers in a time of 1:30 seconds. Next the men’s dunk contest got the crowd up on their feet and screaming with their creativity in dunks as well as costumes. Nate Manning had two costumes for both of his dunks, the more memorable one being the Batman but was unable to reach the championship round. Carl Steen and Daniel Butler II were the two finalists in the championship round. The contest ended with the defending champ from last year Carl Steen coming out on top once again, with a ridiculous dunk. Octavio Parral bounced the basketball off the indoor track wall, which then bounced on to the court where Carl was there to put it down with a bang! Both men’s and women’s teams put up a good showing not only at the purple and white night but also in their scrimmages against Hesston College from Kansas beating by double digits. When asked about the upcoming season, Senior Errick McCollum said he “expects his team to make a national appearance and the first years to get in to rhythm of things quickly and contribute a lot during the season.” Both the Men and Women teams have depth in their line up allowing them to be more versatile and threat in the MCC conference. The Men’s team will kick off their season on Nov. 3rd at Indiana University South Bend, with their first home opener on Nov. 6th when they host the Maple City Hoopfest. The women’s team will also start their season away versus Indiana University South Bend and have their home opener on Nov. 11th against Indiana Tech.